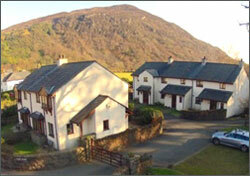 high-quality holiday cottages. The owners house is also within the estate. 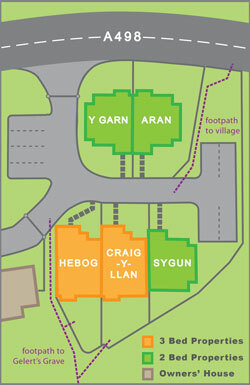 All the cottages are 5-star rated by Visit Wales and aim to be a 'home from home'. views over private patio to the Pass of Aberglaslyn beyond. 4 people (one double with en-suite facilities and one zip-link double/twin). The main bathroom contains both a shower and a bath. Click on each property type to view a more detailed description. Bedlinen and towels (one hand and one bath towel per guest) are supplied. We request that all guests refrain from smoking inside the cottages. All cottages are fitted with smoke alarms, fire extinguishers and fire blankets. Sorry but we do not allow pets to stay at Coed Gelert.